6.7L Kit comes with a BD 2-piece high flow exhaust manifold, a special 4-inch exhaust down pipe and complete “Special EGR” hardware kit – performance tuner such as H&S XRT PRO (109005), H&S Mini Max (109003), Smarty (MADS67ME) or Smarty Jr. (MADJ67ME) is required for 6.7L operation. 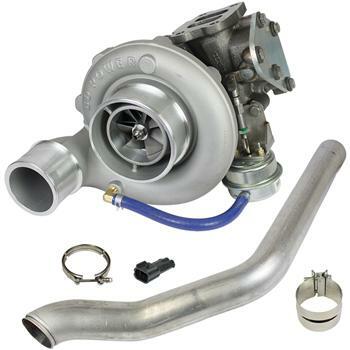 Add the larger BD Cool-It Intercooler and a shot of nitrous oxide, and the Super B Special will produce even higher power levels with adequate fuel delivery. This turbo kit comes complete with exhaust down pipe, clamps and adustable wastegate.